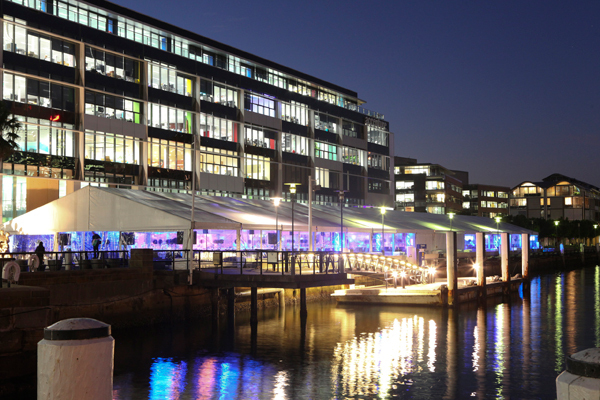 1200 guests enjoyed a black tie gala dinner hosted by Sydney’s award winning Doltone House, in a purpose built marquee on Darling Island Wharf Pyrmont to support a very worthy cause. Sydney’s Doltone House, Darling Island Wharf Pyrmont hosted the 4th Biaggio Signorelli Foundation Gala Dinner on Wednesday 26th September with the attendance of Her Excellency Professor Marie Bashir AC CVO, Governor of NSW and The Hon. Barry O’Farrell MP Premier of NSW. The foundation is committed to raising awareness, early detection, treatment and cure for the asbestos-related cancer (Mesothelioma) – the Signorelli family’s tribute to their father and the founder of Doltone House Group who passed away from the cancer in May 2008. The credibility of the foundation has been captured by the NSW Government in both 2010 and 2011 having received two consecutive government grants totaling $150,000. The foundation has raised almost $1m and key achievements include the funding of three research fellowships of $300,000 each over three years. Dr Anthony Linton and Dr Casey Wright housed at the Asbestos Diseases Research Institute in Concord, as well as Dr Tristan Yan, the Biaggio Signorelli Foundation Director of Thoracic Oncology housed at The Baird Institute. The foundation has also contributed $125,000 towards the development of the National Guidelines for Diagnosis and Treatment of Mesothelioma. The foundation’s reputable board is made up of Former NSW Premier Morris Iemma; radio presenters Jason Morrison of 2UE & Glenn Wheeler of 2GB, Keith Cox (head chemotherapy nurse at RPA), along with Doltone Houses’ family Directors, Paul Signorelli, Nina Milazzo and Anna Cesarano. In addition to esteemed company, the evening treated guests to fine food and beverages, a fantastic entertainment line up including Anthony Callea and Prinnie Stevens, along with great prizes for the major raffle and live auction under the stars on Sydney’s Harbour. Fittingly, 26 September also marked National Mesothelioma Awareness Day in the USA, a day dedicated to raising the public’s awareness of Mesothelioma and to encourage all American’s to help raise funds to combat the deadly disease.